During a recent stay in the US, I had been on two United Airlines flights. Like Lufthansa, United is a member of the “Star Alliance” group of airlines. Being a member of Lufthansa’s Miles & More loyalty program, I should have earned award miles for the United flights, but since someone else had made the booking for me, I had not been able to supply my membership number. Unsurprisingly, when I later checked my Miles & More account, I had not received any miles for the two flights, and — ticket stubs close at hand — I set out to claim those uncredited miles via the Miles & More website. After signing in, I went to the page with the detailed account statement. Since this page lists all recent account transactions, I thought this also was the most logical place to look for information on what to do if any transactions were logged incorrectly or simply missing. Scanning that page for a link or a button titled “request mileage credit,” “claim uncredited miles,” or similar, yielded no result. The only link that looked mildly promising was “Account statement and mileage expiry queries” at the very bottom of the page. I clicked on it, expecting to find concise and helpful information about what I could do within the context of the account statement page. What I got, instead, was too much marketing ramble — “Quick and easy access to information!”, “Why not subscribe to the free Miles & More Online newsletter?”, etc. — and too little helpful information. Neither seemed relevant to my task. 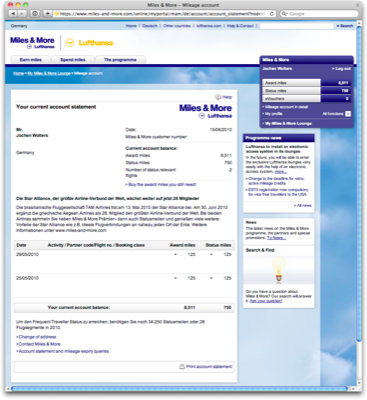 Now that I knew that “mileage request” is the term Lufthansa uses for “claiming uncredited miles,” I again searched the account statement page for a direct link to the claim form. Unfortunately, there are more problems with that menu than just the fact that most of its items are hidden by default. Apart from the two words, “All functions,” there are no visual cues in that blue box that point to the existence of a hidden menu. The icon next to the link does not resemble a standard disclosure triangle as found in, e.g., the Mac OS X Finder or Windows Explorer, and it points to the right, seemingly to a location off the screen. Which may make you wonder whether clicking it will take you to another page showing, well, all functions. Once opened, the menu is overwhelming: the font is very small (and, consequently, so are the link target areas); there is no grouping; and the sort order seems arbitrary. E.g., “Change PIN” and “Change Password” seem to be related to the “My profile” item, yet they are placed far apart from each other. 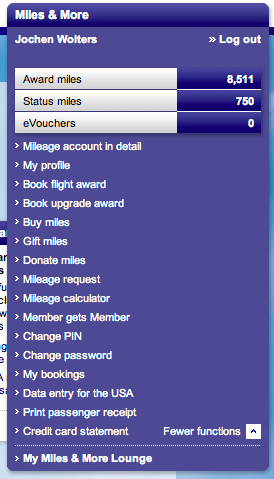 “Book flight award” is about spending miles, as is “Gift miles”. And yet, they are separated by “Buy miles,” which is related to earning miles. As for the menu items themselves, they seem overly curt. Adding a bit of redundance — e.g., using “Donate miles to charity” vs. “Donate miles” — may help grasping their meanings faster. Also, there is a subtle difference in the syntax of the items: some consist solely of nouns like “Mileage calculator,” whereas others contain a verb, as in “Buy miles”. By the way, would you guess that the rather unforunately phrased “Member gets Member” takes you to a page for inviting someone to join Miles & More? As I stated before the menu diatribe intermezzo, I had managed to find the appropriate page for having the miles from those two United Airlines flights “retrospectively credited” to my account. One more click on that page took me to the form for entering my flight details. A very welcome feature of this form is the “Number of flights” popup menu: you can enter up to ten flights in one session, which, I would assume, should be more than enough for most travelers. Unfortunately, there is a lot of information that needs to be entered per flight, however, and it is not all that obvious where to find the respective data on the ticket stub. 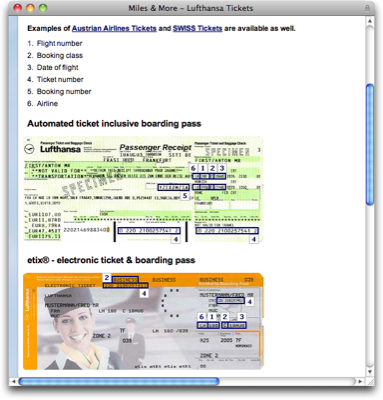 A page called “Ticket examples” that explains where to find what, comes in really handy at this point. I do wonder, though, why I needed to enter the departure and arrival airports: shouldn’t the website’s database backend “know” a flight’s route based on the flight number and flight date, which I had to provide, as well? the request form would not require entering so many data items. For a quick comparison, I went to the British Airways website to see what their implementation of this workflow looks like. As I said earlier, I assume that claiming uncredited — or “missing” — miles is one of the most often-used functions on the account page. Unlike their Lufthansa colleagues, the designers of the BA site seem to share this point of view and placed a respective link right where I as a user need it and, consequently, where I will look for it first. The link is easy to find; it is easy to understand thanks to perfectly clear phrasing; and it takes you directly to an entry form. 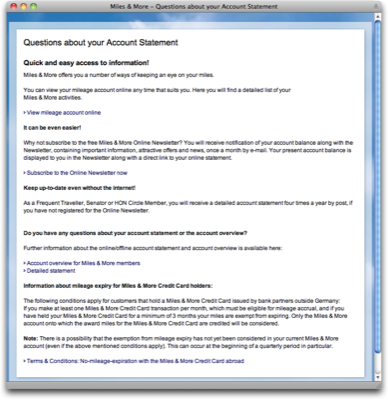 The actual entry form page provides concise help in the form of bullet points; a link to an FAQ list, which — unlike Miles & More’s “Questions about your Account Statement” — happens to actually be an FAQ list; a few related links. And it requires you to enter exactly one data item: the ticket number. 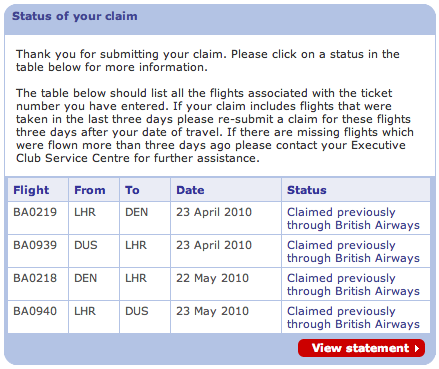 I don’t have to go search for the “Claim missing BA miles” form because the link to it is located exactly where I would look for it in the first place. The language used by BA makes it easier to understand where that link takes me. For the first step of the process, all I have to enter is the ticket number. 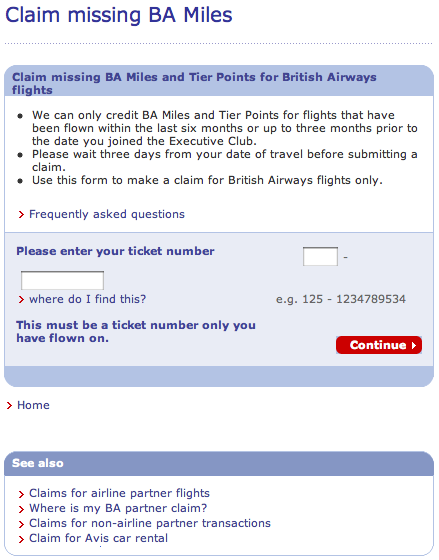 Based on the ticket number, the BA website verifies whether miles have already been credited for the corresponding flights, which may spare me additional effort in case I have simply overlooked them on my account statement. 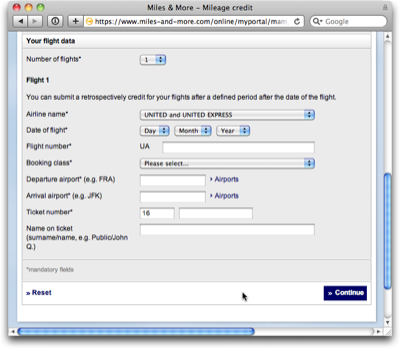 Of course, this is only one task of many that you can perform on an airline’s website. And yet, I find it striking that a standard function like claiming uncredited award miles can differ so fundamentally in how easy, convenient, and sometimes even pleasant they are to use.